182 leaves (1 column, 17 lines), bound : vellum, ill. ; 109 x 74 mm. Arms of patron/former owner on fol. 2v; #637 Walter's sale (inscribed on front flyleaf); purchased by Julia Parker Wightman in 1941; JPW 2295; note inscribed "for Morgan's choice '92 John Plummer; Julia Parker Wightman Bequest in 1994. Ms. book of hours, use of Rome (Hours of the Virgin); written and illuminated in Bruges, Belgium, 1470-1475. Texts: Fols. 3-14v - Calendar; fols. 15v-22v - Hours of the Holy Cross; fols. 23v-28v - Hours of the Holy Spirit; fols. 29v-93v - Hours of the Virgin; fols. 94v-102v - Hours of the Virgin for Advent; 103v-123v - Penitential Psalms and Litany; fols. 124v-165v - Office of the Dead; fols. 166v-182 - Psalter of St. Jerome. 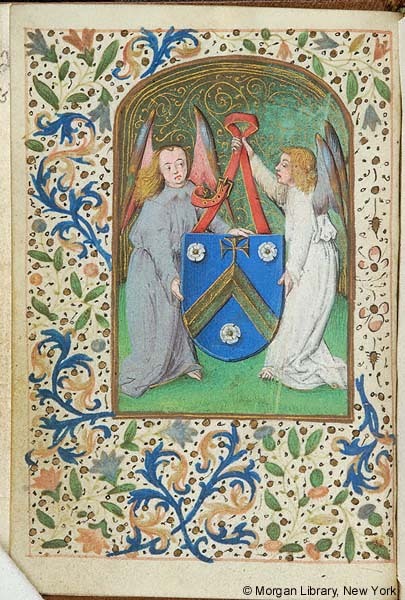 Decoration: 17 full-page miniatures with full borders, 17 large illuminated initials with full borders. Artist: early work by the Master of Edward IV. Binding: 18th-century brown morocco, gold-tooled, gilt edges, in tan pigskin box labeled: Horae Beatae Virginis Mariae 16 cent, signed JPW 1941.